Thank you all for another awesome year. Thanks to the Inyo Register for printing our weekly reports – whether they were about fish, the weather, the flowers, and the wildlife or just Lake life – Thank you! And thanks to Ernie Cowan from Western Outdoor News for getting the word out. Thank you to all the other local outlets that report ‘What’s happening at the Lake’ – it is very much appreciated. Most of all THANK YOU to you! What a couple of glorious weeks up at the Lake and lots and lots and lots of people last weekend mostly with camera and tripod in hand. It was a constant stream of vehicles circling the lot and parking in some pretty interesting ways. We’re pretty much past our leaf color prime, but Aspendell is just starting to turn. We had a few snow flurries last week and it looks like there is some weather coming in Friday – 70% chance of RAIN and WINDY thru the weekend and another 60% chance of RAIN on Sunday. Taking that into consideration, our last day of boat rentals MAY be THURSDAY, OCTOBER 13TH – WE WILL NOT BE TAKING BOAT RESERVATIONS FOR THE WEEKEND. We will be concluding the Lake Sabrina Boat Landing season on Sunday, October 16, 2016 at 1:00pm. 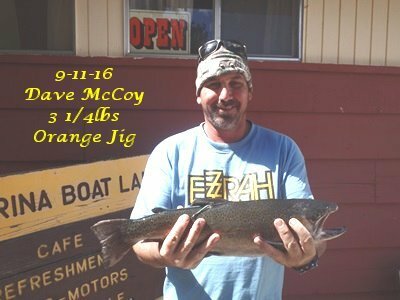 Fishing season closes in the Eastern Sierra on November 15, 2016. You can still launch your own boat at the Lake or fish from shore until then. Over the last couple of weeks we’ve had a few nice fish come out of the Lake even a couple of BROWNS. Brown Bagger George Kirby landed not one but two BROWNS – a 4-1/2 pounder along with a 3-1/2 pounder. Both were released! Jackie Nersesian caught a very nice 3-1/2 pound Rainbow using a NightCrawler. Tom Farrell, Jeff Mellinger and Phil Moores showed off some nice stringers catching them with the tried and true NightCrawlers and Red and Gold Thomas Buoyants. 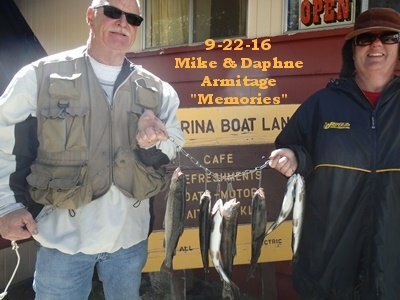 Mike & Daphne Armitage also had a nice stringer using NightCrawlers. Like I said before – we’ve got a bit of weather heading our way and boy do the trees need a drink. We’re hoping for snow, but the temps look a bit on the warm side for the white stuff – highs next week look to be in the low 60s to upper 50s with a chance of rain on Friday and Sunday and lows ranging anywhere from the mid 30s to the mid 20s. Also, sounds like we might get some wind over the weekend. You can check out the weather forecast according to Howard our local weather ‘guesser’ at www.MammothWeather.com. You can also check out http://www.weather.gov– enter Aspendell, CA (which is the little community right below Lake Sabrina) in the search field – once the website comes up, scroll down a bit to get the temps in Aspendell. Still some issues with skeeter and meat bees, when using the bug juice, try not to get it on your hands – you’ll transfer it to your bait and the fish just don’t like bug juice or sunscreen or lotion or cologne or perfume. Wash your hands in the stream or Lake to get it off, and then use some fish attractant on your hands. If you’re coming to the Lake, don’t forget sunscreen and dark glasses –the snow and sun makes it pretty bright against the blue sky. DON’T FORGET THAT JACKET. People, sure would be nice if y’all would pick up your trash when you leave. It’s really not that hard. Just sayin! If you need something to put it in, come into the store and we’ll give you a bag. A pet peeve – if you catch a big fish or a limit just to have your picture taken for the webpage and then try and give your fish away – we won’t post your picture, but then again we may post it as ‘WASTER OF A PERFECTLY GOOD FISH TO EAT’! Crimp down your barbs, take a picture on the boat and release it for another day. If you’re hiking stay safe out there. Remember to leave a note about your destination and approximate return time and a clothing description. And you might want to hike with a buddy. Fishing etiquette is becoming a bit of a problem at the Lake and we don’t like problems. If you come upon someone fishing, please don’t fish right next to them – take a bit of hike farther down and don’t cast over into their spot. Same at the Inlet, there are so many areas to fish on this Lake go find another ‘soon to be’ favorite spot. Again, THANK YOU! Hope to see you all next year!